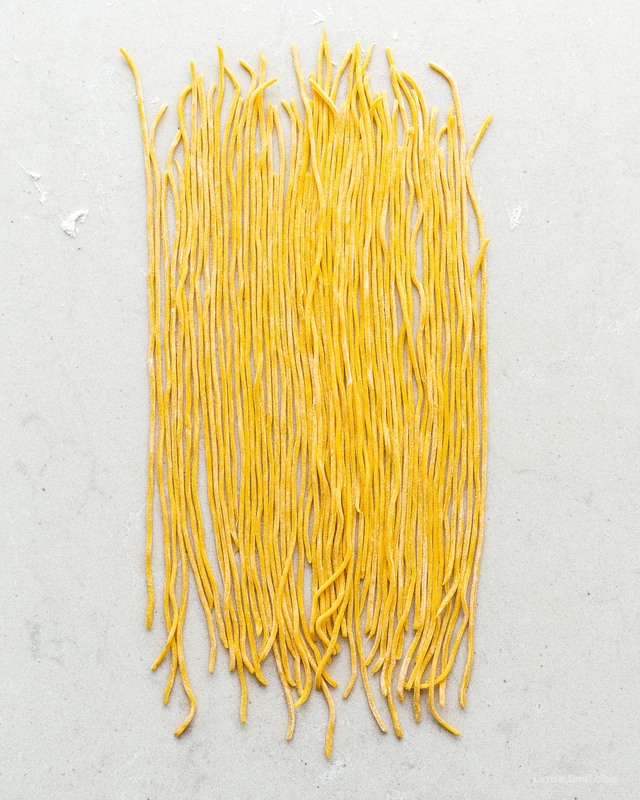 Making fresh pasta at home is easier than you think and spaghetti alla chitarra is one of the easiest shapes to make. 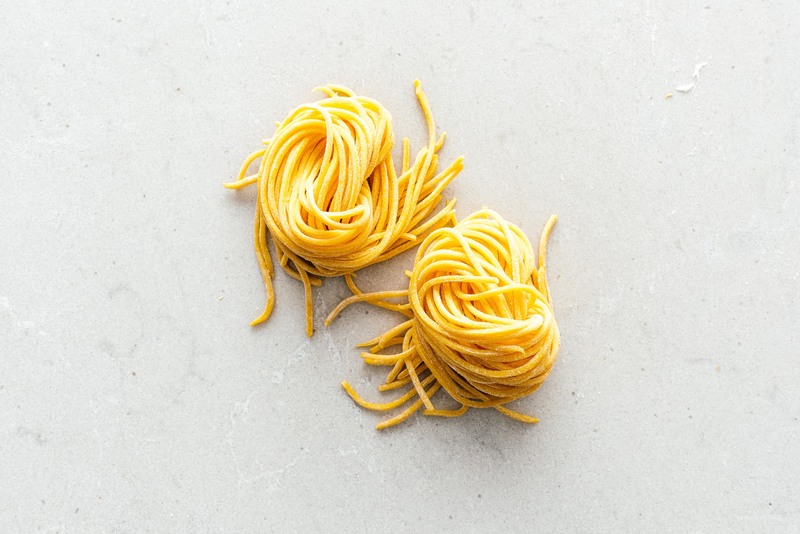 Have you guys heard of spaghetti alla chitarra? It’s a square-cut spaghetti that comes from the Abruzzo region and is very traditional. It’s made using a “chitarra,” or guitar, a wooden frame that has wires strung across it. 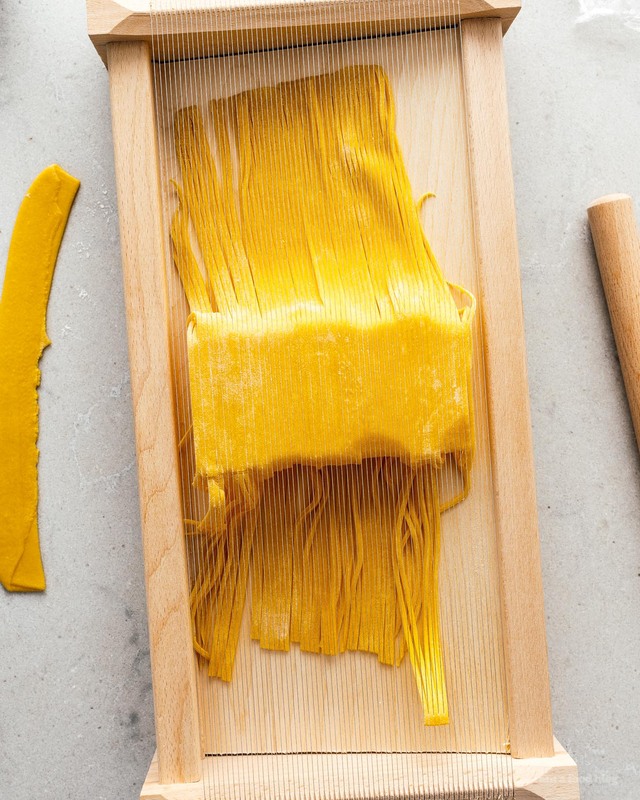 Sheets of pasta are rolled over the strings, pressing the pasta through and cutting it into precise strands that end up having squared off edges, instead of the more common round spaghetti that is extruded. It’s really fun to make and easy too! You do need a chitarra – or a very steady hand and a sharp knife – but chitarras are relatively affordable online. 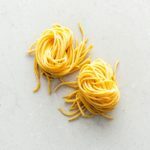 They strands are a little bit more hearty and al dente than other egg pastas, holding up to ragus and sauces wonderfully. The best part is “playing” the chitarra. Sometimes the strands don’t come loose when you roll them through. To pop them out, just gently strum the strings and the strands just fall into the little well at the bottom, ready to be cooked. Place 100 grams flour in a large bowl and make a well in the middle. Put the egg and egg yolk into the well and use a fork to whisk the eggs, slowly incorporating the flour, little by little, until and dough starts to form. Turn out onto a lightly floured board and knead the dough until smooth and elastic, then wrap with plastic wrap and let rest for 1 hour. Alternately, use a food processor to bring the flour and eggs together until they resemble coarse bread crumbs. Tip out onto a lightly floured board and knead. After the pasta has rested, lightly dust with flour and press into a rectangle shape. From here you can either roll out the dough by hand using a rolling pin, or you can use a pasta machine to roll out the dough, starting at the widest setting, and dialing it down after roll. When the pasta reaches your desired thickness, it’s time to cut it. You can either cut it by hand, using a knife, or use the pasta machine with the spaghetti setting. Or, you can use a chitarra. 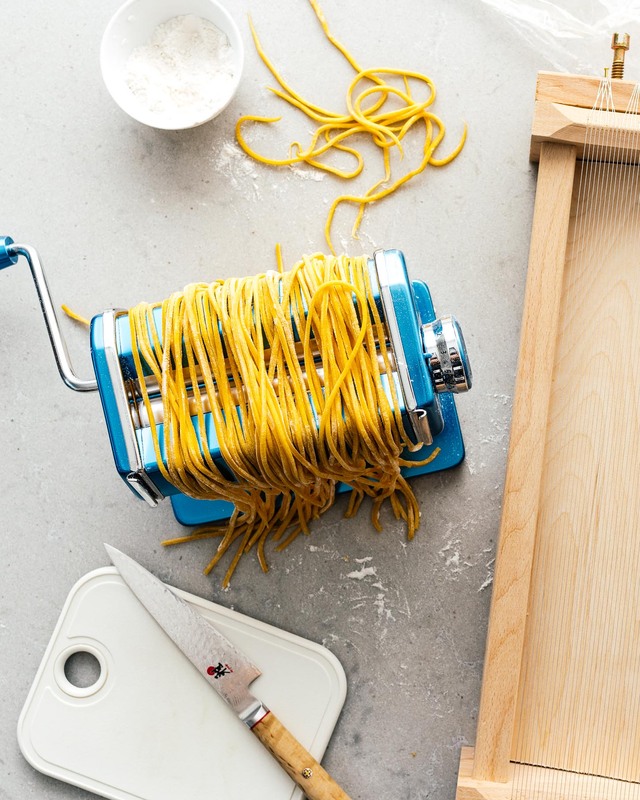 To use the chitarra, trim your pasta sheet to slightly smaller then the length of the chitarra, then use a rolling pin to push the dough down so that the strings of the chitarra cut the pasta into spaghetti. Shake out the strands of pasta, lightly dust with flour and let dry slightly. To cook, bring a large pot of very salted water up to a boil and cook for 2-3 minutes, or until al dente, to taste. Use in your favorite pasta recipe. Maybe even this lemon pasta! That looks great! There nothing quite as good as homemade pasta.